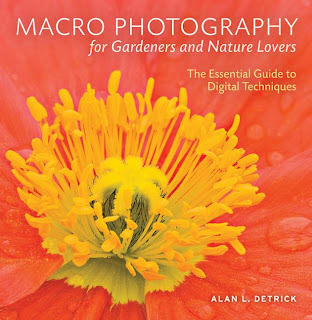 Detrick defines macro photography as “capturing an image that’s at least the same size on film or digital sensor as the actual subject and up to 10X the size of the actual subject”. 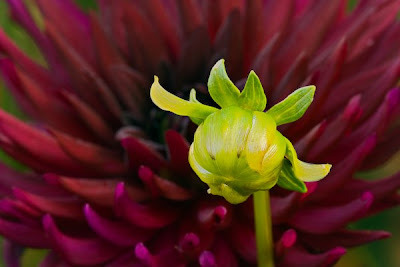 There’s absolutely no need to be either a gardener or a nature lover to enjoy ‘Macro Photography’. It will tell any photographer how to capture fantastic light and patterns, and the flowers, leaves or insects can be almost incidental. His discussions of backgrounds struck a chord, because while I’m very aware of junk in a picture, I’m much less aware of how adding (or subtracting) splashes of background color can make or break the image. But maybe because I am a dedicated gardener, I found the bug images particularly enchanting, a change from my usual concentration on flowers and foliage. 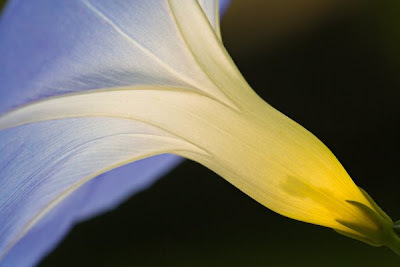 I’m left with the feeling that even I could capture a pollen covered bee just crawling out of an early morning flower if I follow the master’s tips. There’s a big downside to this book however. It’s hard to simply read and admire. It may cause you to run out to buy a macro lens, the low tripod, cable release and other necessities to try macro yourself. Detrick is a one-man economic stimulus package. While I also know Alan, I consider myself unbiased because I've never worked with him and we don't hang out. So in my COMPLETELY unbiased opinion, everything Other Ellen said about the book is true. I read it straight through but kept wanting to get up and try each of Alan's suggestions. If it hadn't been 32 degrees and freezing rain I would have...he's just that inspirational. Buy the book now; it's on sale (30% off) from now through 12/31 at www.timberpress.com. Well, I guess I'm buying a new book. The question is, who shall I say it's from when I put it under the tree??? By all means say it's from 'Ellen'. That covers a lot of ground here at Garden Bytes.